Whether your child is one month old, one year old, or even four years old; singing nursery rhymes to them will help them learn and grow. You can even start when the two of you are expecting. If you start singing a nursery rhyme, then they will recognize it when they are older. 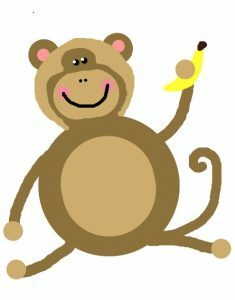 There are many benefits to singing the five little monkeys song and three of those are being active, learning to count, and learning how to talk. Kids love the 5 little monkeys nursery rhyme. For babies, all you have to do is make silly faces while you are singing to them and they start to laugh. For toddlers, it teaches them to jump. When kids start jumping, they become more active. If you are acting out the rhyme, then jump and see if they will jump with you. If your child is not jumping yet, then you can jump with them. That will teach them how to lift their feet off the ground. Also it will get them dancing. There are many little kids that can hear a tune if you sing it to them. When singing the five little monkeys nursery rhyme, make sure you sing it slowly because it can teach them how to count. You can say the numbers forwards and backwards. If you do it every day, then it will catch on. You may even see them counting to five just by singing nursery rhymes with numbers. Another huge advantage is that it can teach your little one to talk. If you sing the nursery rhyme everyday, or other rhymes, then they may start saying words from your rhymes. You may be surprised at how fast small children catch on when you are singing the same rhyme every day. The 5 Little Monkeys song is a great song for small children to get up on their feet and start learning how to jump or getting them to move by having them dance. Counting will play a huge part in your child’s development by singing this song since it has numbers. Also your child may learn to talk by saying monkeys or little as their first word. Acting out rhymes is a great way to spend quality time together as a family and to watch your child develop his or her skills.